Two sophisticated U.S. military communications satellites launched earlier this year for distinctly different missions have entered initial service lives in geosynchronous orbit 22,300 miles above Earth. The Navy's Mobile User Objective System 1 spacecraft was carried aloft by a United Launch Alliance Atlas 5 rocket from Cape Canaveral on Feb. 24 and the Air Force's Advanced Extremely High Frequency 2 satellite followed from the same pad atop a similar Atlas on May 4. 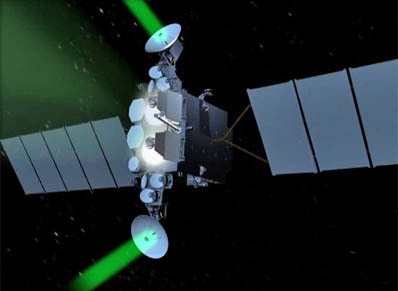 MUOS is the first in a new space-based constellation for global mobile communications to replace the military's aging Ultra High Frequency (UHF) spacecraft fleet with substantial new capabilities for smartphone-like flow of information around the battlespace. "Whether it's in vehicles, on ships, in submarines, in aircraft, or simply carried by service members who are dismounted from vehicles and on the move, this system was designed to bring them voice and data communication services, both in point-to-point mode and through networked communications. Those capabilities have not existed with previous programs," said Navy Capt. Paul Ghyzel, the MUOS program manager. A single MUOS spacecraft provides more communication access than the Navy's current 8-craft Ultra High Frequency Follow-On satellite constellation combined. The Navy announced Nov. 21 that MUOS 1 has been accepted for operational use, completing its post-launch maneuvering, testing and checkout process. "This provides the warfighter with powerful capability," said Vice Adm. Michael S. Rogers, commander, U.S. Fleet Cyber Command/U.S. 10th Fleet. 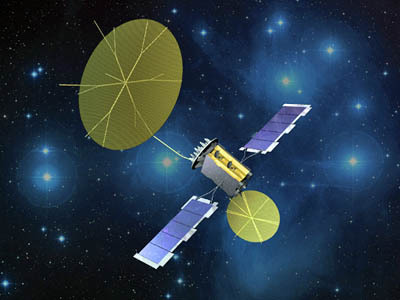 MUOS 2 will go up in July 2013 aboard an Atlas 5 and the subsequent two primary satellites and one orbital spare will follow at a launch rate of approximately one per year, providing a full operational constellation in 2015 and extend the Navy's narrowband communications capacity well past 2025. The subsequent Atlas rocket launch after MUOS 1 was AEHF 2, the second spacecraft in a new constellation of ultra-secure communications satellites to link the president with military forces anywhere on the planet. AEHF 2 was delivered to space from the Cape on May 4, kicking off three months of maneuvering to reach the proper orbital position and commence its testing program. Officials announced Nov. 14 it had completed those activities and been turned over to the 14th Air Force for operations and a 14-year service life through 2026. "The U.S. Air Force, Lockheed Martin and Northrop Grumman AEHF team performed a thorough and efficient on orbit test campaign for this critical satellite, and AEHF 2 is performing exceptionally well," said Mark Calassa, Lockheed Martin's vice president and AEHF program manager. "With the first two AEHF satellites now on orbit, the Department of Defense is well on its way to augmenting, improving and expanding its critical military satellite communications architecture to meet increasing demand from users worldwide." AEHF 2 is the second in a series of at least six satellites to ring the globe and ensure a survivable line of contact between the president, military commanders and troops on the battlefield even in nightmarish scenarios of nuclear war. Communications relayed through AEHF also include critical support to Special Operations, situational awareness for Army troops, giving last-minute targeting information to deployed Air Force fighters and transmitting Tomahawk missile updates to the Navy. "Completion of on-orbit testing and handover of AEHF 2 is a critical milestone for the Air Force and our nation," said Dave Madden, Director of the Military Satellite Communications Systems Directorate at the Air Force's Space and Missile Systems Center. "The AEHF satellites on orbit and those planned for launch will play a pivotal role in our national security for years to come." AEHF 3 is undergoing final factory work before its launch atop an Atlas 5 next September from the Cape. Designers say a single AEHF spacecraft has more capacity than the heritage Milstar's five-satellite constellation that the new system will replace.